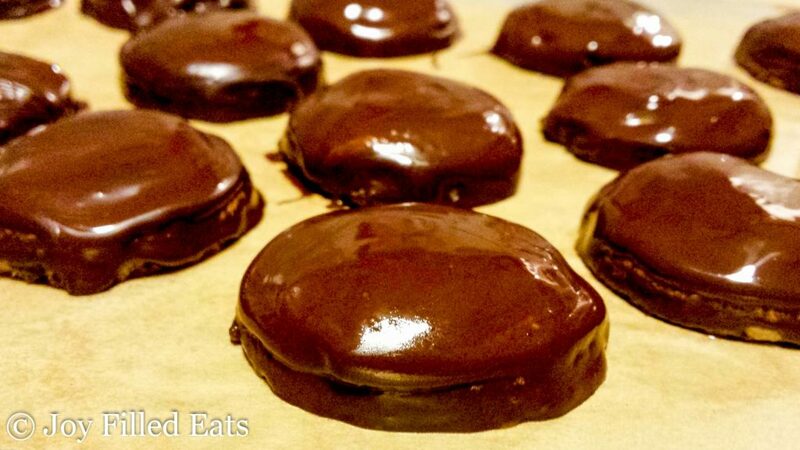 My Tagalong Cookies are gluten free, egg free, grain free, sugar-free, low carb, and a THM S. You can enjoy this treat without any guilt! You should all be very happy that I don’t like football. While most of America was sitting on couches watching the Super Bowl I was in the kitchen experimenting and this was the result! I haven’t had a real girl scout Tagalong cookie (are they still even called that?) in many years but I remember them vividly. 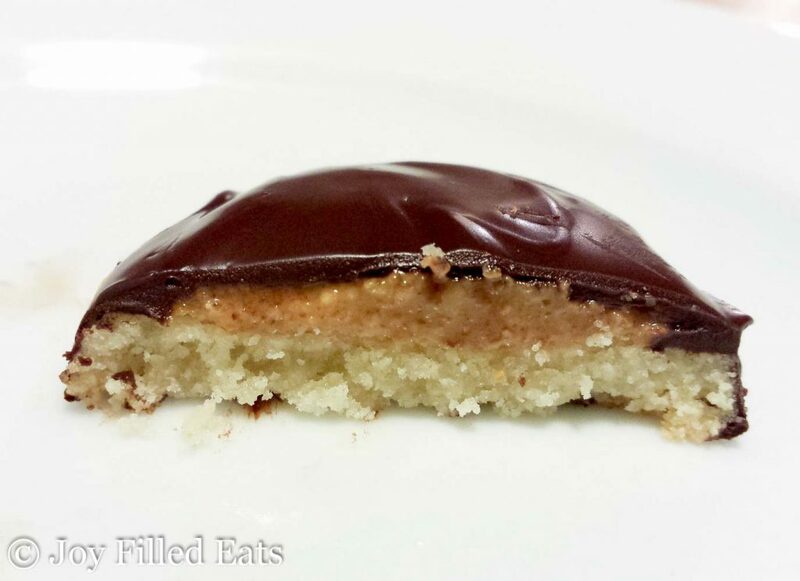 Tagalong cookies were one of my favorites as a teen. Samoas still win as my favorite but these tied in second place with Thin Mints and Trefoils. I’m probably dating myself using the names from my own Brownie days. These Tagalong cookies are really good. Even the hubby said they were delicious (I popped one in his mouth during a commercial). They are not super sweet though. If you have a real sweet tooth use the higher amounts if sweetener listed and use sugar-free chocolate instead of the 85%. You can really taste the chocolate so make sure to use one you love. 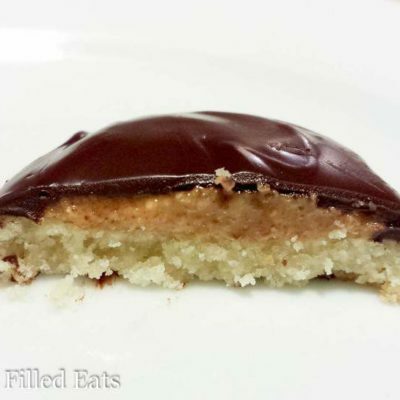 If these are looking a bit too labor intensive try my simplified Tagalong Cookie Bars recipe! 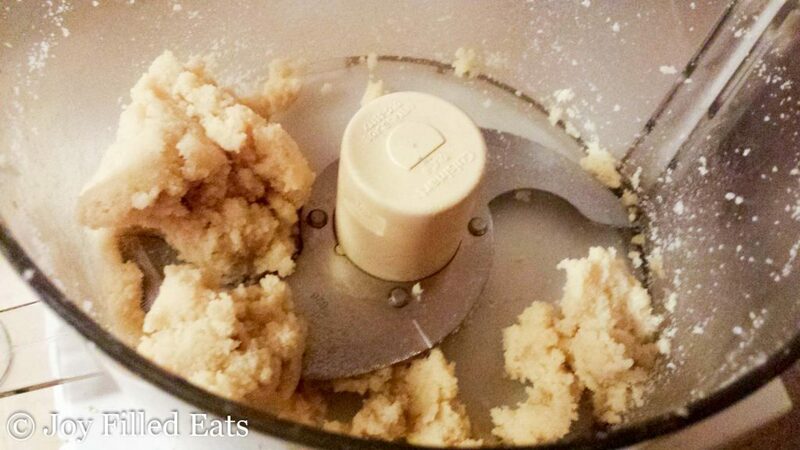 Put the almond flour, sweetener, gelatin, and salt in a food processor and pulse to combine. Add the butter and vanilla and pulse until tiny crumbs. Add the water and pulse until a dough forms. Put the dough between two sheets of waxed paper. Roll it out about ¼ inch thick. Using a circle cookie cutter or an upside down glass (or any random circle object from your kitchen like my ice cream holder) cut out circles. Lift gently with a spatula and put on a cookie sheet lined with parchment paper. Reroll the dough and make circles until you use it all. You will get about 20 cookies. Bake 12 to 14 minutes or until golden brown. Let cool completely. Meanwhile you need to make the peanut butter layer. Put the peanut butter in a small bowl and sprinkle the gluccomannan on slowly whisking between each sprinkling. Add the sweetener and peanut or almond flour. Whisk well. 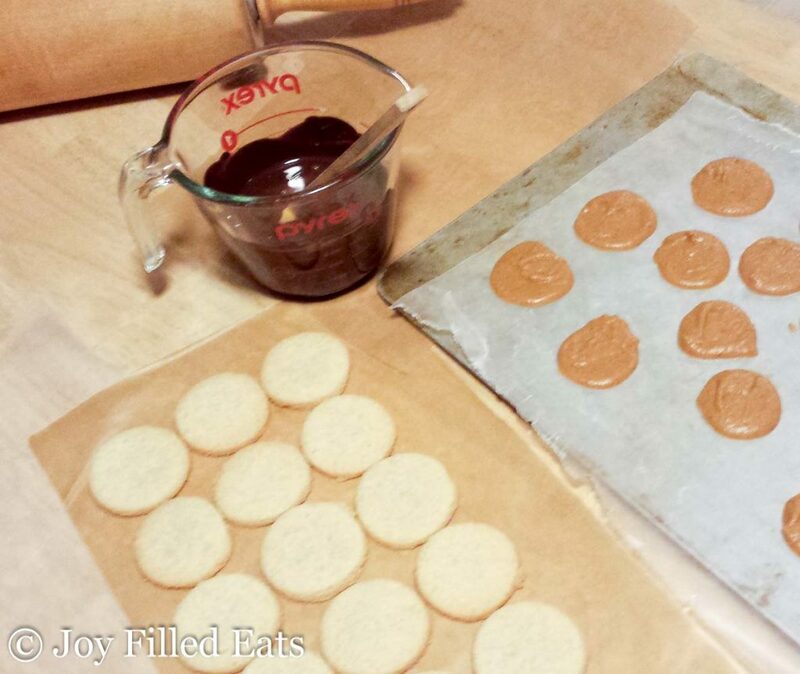 Drop scant teaspoons onto a cookie sheet lined with wax paper equally the same number as your cookies. Freeze until firm. Melt chocolate in the microwave. Start with thirty seconds and then stir. Continue microwaving for thirty seconds increments and stirring after each until the chocolate is 75% melted. Then just stir until it is all melted. Put one frozen peanut butter disc onto each cookie. Drizzle with melted chocolate covering as much as possible. Using a knife or offset spatula make sure the sides are covered. At this point I lift onto a different piece of waxed or parchment paper to get cleaner edges (you can reuse the parchment you baked the cookies on). Refrigerate to set the chocolate. 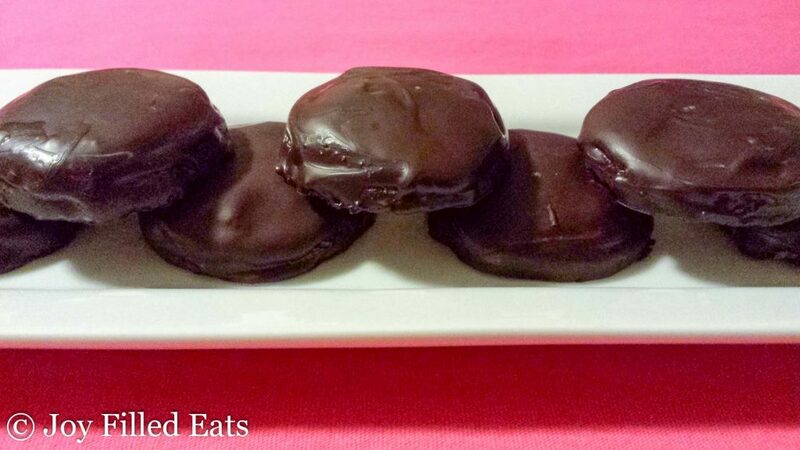 Enjoy your Tagalong cookies! How many in one serving? The nutrition facts are for 1 cookie. Do you have to use the glucomannan? Is there a substitution I could use? It's just to thicken the peanut butter. You can use xanthan gum instead. hey i was just wondering whats the nutrition here like the carb count etc? I tried this recipe tonight and my husband absolutely loves it! He said "what's not to like about these?"! Reblogged this on That Organic Mom and commented: Gotta make these! I am definitely going to try this recipe. I wonder if you'd consider making it printable? I like to keep my favorites in a binder. For now I'm just going to pull it up on my iphone in the kitchen!! Thanks for sharing! That's on my to do list. 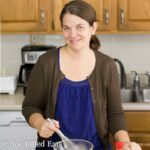 I'm new to blogging so I'm learning as I go. Need to figure out how to add a printable option to WordPress. I'm in the same boat but I did add a printable from Google Docs. It's not pretty but it gets the job done for now.